Douglas Fischer writes for DailyClimate.org, a foundation-funded news service covering climate change. SAN FRANCISCO – To get a glimpse of the future, look to East Africa today. The Horn of Africa is in the midst of its worst drought in 60 years: Crop failures have left up to 10 million at risk of famine; social order has broken down in Somalia, with thousands of refugees streaming into Kenya; British Aid alone is feeding 2.4 million people across the region. That’s a taste of what’s to come, say scientists mapping the impact of a warming planet on agriculture and civilization. “We think we’re going to have continued dryness, at least for the next 10 or 15 years, over East Africa,” said Chris Funk, a geographer at the U.S. Geological Survey and founding member of the Climate Hazard Group at the University of California, Santa Barbara. Funk and other experts at the American Geophysical Union meeting in San Francisco cautioned that East Africa is just one example. Many recent events – discoveries from sediment cores of New York marshes, drought in Australia and the western United States, data from increasingly sophisticated computer models – lead to a conclusion that the weather driving many of the globe’s great breadbaskets will become hotter, drier and more unpredictable. Even the northeastern United States – a region normally omitted from any serious talk about domestic drought – is at risk, said Dorothy Peteet, a senior research scientist with NASA’s Goddard Institute for Space Studies. Of course, climate change can’t be blamed for all the food shortages and social unrest, several researchers cautioned. Landscape changes such as deforestation can trigger droughts, while policy choices exacerbate impacts. Some hard-hit African countries have the highest population growth rates on the planet, and gains in agricultural productivity simply have not kept up with those extra mouths. Per capita cereal production, for instance, peaked worldwide in the mid-1980s, Funk said, and is decreasing everywhere. But no place on the globe is decreasing faster than East Africa. Simple policy decisions can blunt a crisis. 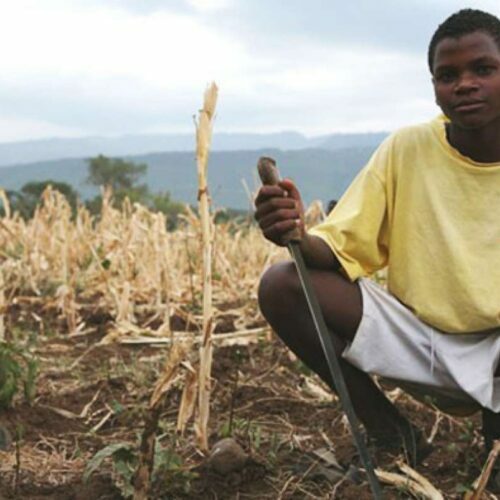 Malawi, in southeastern Africa, gave farmers bags of seed and fertilizer and saw food prices fall and the percentage of its population classified as undernourished drop by almost half over a decade, Funk added. Kenya, in contrast, saw its policies stagnate; prices and malnourishment rates both rose. Meanwhile, researchers probing the climate in pre–Colombian Central America figure that widespread deforestation had a hand in the droughts thought to have toppled the Mayan, Toltec and Aztec civilizations. More than 1,000 years ago, “significant deforestation” throughout Central America suppressed rainfall upwards of 20 percent and warmed the region 0.5ºC, said Benjamin Cook, a NASA climatologist. The forest – and local moisture – rebounded with the population crash that followed European contact, he added. But today the region is even more denuded than during its pre-Colombian peak. But with the frequency of droughts expected to triple in the next 100 years, researchers fear the resulting variability and stress to agriculture and civilization could prove destabilizing for many regions. “We should take it seriously,” Peteet said. Douglas Fischer has spent 16 years covering subjects ranging from climate science to pesticides to energy development. Since 2008, he has served as editor of DailyClimate.org, which is a foundation-funded news service covering climate change.